Average fuel burn, Machine hours worked per shift. 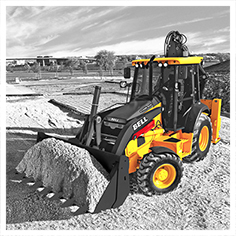 Calculated by an optionally fitted on board weighing system on a Front-End Loader. Automated service reminders can be send to either the customer or closest branch for action, ensuring maximum uptime. The machine position on a selection of maps. Receive the previous day's error codes from the machine each day. Illustrated in a time bar format, indicating idle time vs production time. 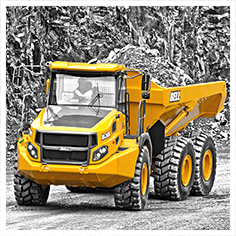 Calculated by a standard fitted on board weighing system on each Articulated Dump Truck. Monitoring of service brake applied time versus retarder activated time. Know which operator is driving your machine. Each driver has a unique driver identification code which can be linked to an expiry date. E-mailed after each shift or displayed on the webpage. Up to 10 live event notifications per day on the web, with the option to send it to a customer's mobile phone as well as an automated event report after each shift. Each event is linked to the driver's Identification if the option is enabled. Know when your machine has been switched on and off.